With hosepipe bans becoming more frequent thanks to global warming (and water companies not fixing the leaks which lose 50% of all treated water in the UK), more and more people are starting to collect rainwater and greywater for use in their gardens. The only problem is getting the water from where it is collected and stored, to where it is needed. Solar power is absolutely perfect for use with irrigation systems for gardens, allotments, greenhouses, and polytunnels. When the sun is shining you need more water and so the solar power is there for the pump. By adding a suitable deep-cycle leisure/marine battery, power can be made available 24 hours per day enabling watering in the evening – the best time to water plants in the summer so that the water has a chance to soak into the ground. 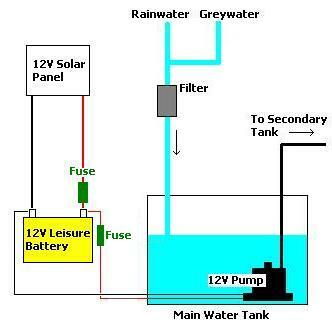 A main water tank is used to store rainwater runoff from roofs and greywater from where it is pumped to a secondary tank when and where it is needed. The secondary tank – e.g. an old dustbin, or a hole in the ground lined with pond-liner – can either be placed at ground level and used to fill watering cans, or in a slightly elevated position to gravity feed water through porous pipe (aka leaky pipe) irrigation (pictured below). The switch to turn on the pump can be located beside the secondary tank so that it can be switched on and off easily. This can be achieved using a run of cheap bell wire or, if you are electronically-minded awireless doorbell can be converted to activate the pump remotely. An automated irrigation system can be put together using a suitable 12V programmable timer which will turn on the pump at the same time every evening. Alternatively a bespoke electronic relay control board* can be put together to supply power to the pump (or many different pumps) with your choice of turn on/off times each day. * Contact neil@reuk.co.uk with details of your requirements if you would like us to put the electronics together for you. To protect the pump from being damaged if it runs out of water to pump, and to prevent any secondary tanks from overflowing, float switches can be used to detect water levels and their readings fed into the electronic controller. 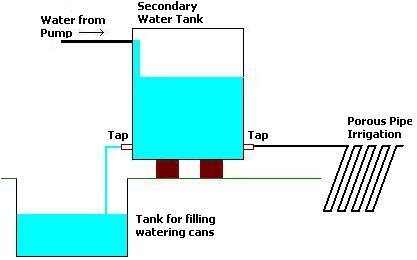 This first illustration shows the solar part of the irrigation system plus the pump used to send the water from the main water tank to the secondary tank at the location where watering is to take place. The panel and battery can easily be located at/in a shed or outhouse and the main tank underground if visual impact is likely to be an issue. This second illustration shows one suggestion for the distribution of water at the greenhouse/polytunnel or other watering location. If porous pipe is to be used then a second tap should be fitted to the secondary tank so that water can be emptied into a watering can directly, or so it can be used to fill a small lined hole in the ground into which a watering can can be dipped and filled more quickly. NEW Where mains pressure water is to be controlled – i.e. you want to automatically control the flow of water down a hosepipe which is connected to a garden tap, a simple watering timer can be used. Click here to read our article Digital Watering Timers and Solenoid Valves.